The Dallas Museum of Art’s strategy to increase accessibility and transparency is being brought to life through creative uses of technology across all the DMA’s departments. The Dallas Museum of Art (DMA) is an encyclopedic art museum founded in 1903. The Museum offers free general admission and free membership in order to welcome attendance and participation. In 2010, the DMA published A Framework for Engaging with Art, a seven-year study to deepen understanding of museum visitor behaviors and preferences. This research continues to inform the museum’s practices and programs, as the organization seeks new methods and technologies for engaging audiences. 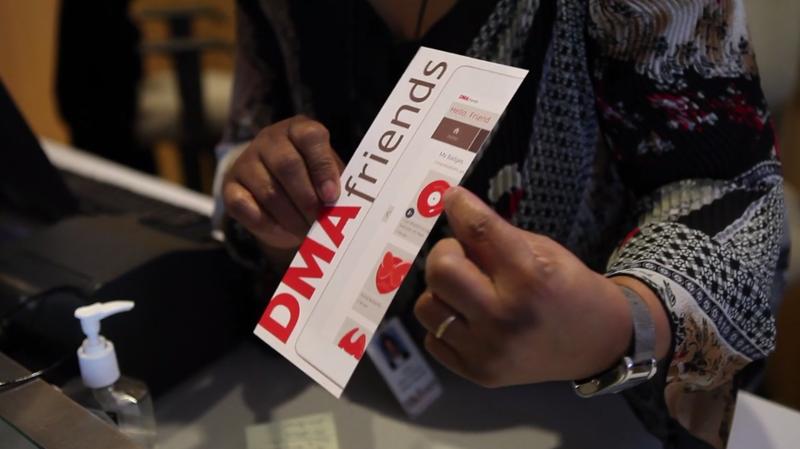 Beyond offering free admission, DMA also offers a free Friends program. After creating an account, visitors can earn points and badges when they attend the museum’s exhibitions, view specific artworks, or participate in programs, each assigned specific activity codes. By entering and amassing points awarded for activities, visitors earn rewards, like special discounts on entry fees or museum store purchases, access to limited availability and behind-the-scenes experiences, and other bonuses. Most badges reward frequency, for example the “Collector” badge is awarded for Friends who text or enter 10 artwork accession numbers found on the labels on specific works. “Art Addict” is awarded to those who visit at least ten times in one year, and “Insomniac” is given to those who attend multiple late-night events. New activities and badges are added regularly. The Center for Creative Connections (C3) is DMA’s 12,000 square foot learning center offering interactive galleries, family programming, discussions, art-making projects, and community events. The C3 Tech Lab invites visitors to experiment with technology to respond to the collection and create new artworks. Photo calls for submissions invite audiences to share photos on a particular theme via Flickr and offers inspirations from the DMA collection on Pinterest. In 2012, the DMA established the Laboratory for Museum Innovation to produce digital projects designed to engage museum audiences and enhance visitors’ experiences. The Lab will explore ways that the DMA can be a living laboratory for museum innovation, investigating subjects that can be broadly applied to the museum field. The DMA website offers visitors free, unlimited access and use of several thousand images of objects in its collection. Web users can search by location, artist, materials, date of origin, department of the museum, and by color to find artworks. The color search tool incorporates a color wheel that is clickable, resulting in works in all media that incorporate the hue selected.